Departure Points: Assisi, Perugia, Spoleto (tour is 1 hour longer from here). Also offered from Tuscany. Other departure points available. Inquire. 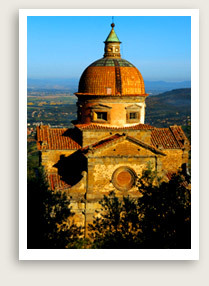 This private day trip features Cortona, one of the oldest hill towns and best-preserved Etruscan cities in Tuscany. As you follow Cortona’s meandering medieval walls, you will be treated to magnificent views of vineyards, olive groves and Lake Trasimeno. As you explore Cortona’s charming medieval streets, it will be clear why it was chosen as the setting for the movie “Under The Tuscan Sun,” The town is also known as the birthplace of the Renaissance painter Luca Signorelli. You will next visit Trasimeno Lake, the fourth largest in Italy. The lake is historic as the site of Hannibal’s victory over the Romans in 247 B.C. You will also make a stop in Passignano, by the lakeshore, for a tasty lunch of freshly-caught lake fish. Time permitting, you can take an optional ferry to the islands situated in the lake itself.